Volunteer organization pays for expensive medications not covered by insurance, drives cancer patients to and from hospitals. It’s a scene that repeats itself all day long at hospital cancer care divisions throughout metro Jerusalem and beyond. In this instance, a driver pulls up to the entrance at Hadassah Ein Kerem’s pediatric cancer ward, and gently assists a fragile-looking young boy and his mother out of the car. With a smile creasing his face, he offers words of encouragement to 14-year-old Uriel Wang. “Thanks for the lift, Uriel is a tough kid, he’ll be fine,” Sarah, his mother responds in kind to the driver - one of dozens of volunteers at the Israel Cancer Support Network, who make it their business to assist families in need. This is a unthinkable subject that few of us like to speak about … cancer. It’s horrible enough to have it, and even more horrific to deal with it on a daily basis. The physical and fiscal strain from arranging doctors’ appointments and transportation to the hospital and back, while trying to maintain a "normal" family life is a hurdle that many people have a difficult time overcoming. Even finding the time for a cup of coffee in order to de-stress can be a challenge. It’s an emotionally grinding drill that was all too familiar to Arele and David Weingarten, when their mother, Miriam succumbed to the disease after prolonged cancer treatment. Recognizing the need to provide various types of assistance to cancer patients and their families, the Weingarten brothers created Darkei Miriam in memory of their mother. In less than a decade, the organization has grown into the Israel Cancer Support Network (ICSN). That support is spearheaded by dozens of multi-lingual volunteers from metro Jerusalem and from farther away, who take time out from their own busy lives in order to drive cancer-stricken children and adults to and from the hospital, around the clock, throughout the year. They’ve also set-up fully stocked coffee stations in cancer wards so that the patients and families can savor a hot drink at any hour of the day. 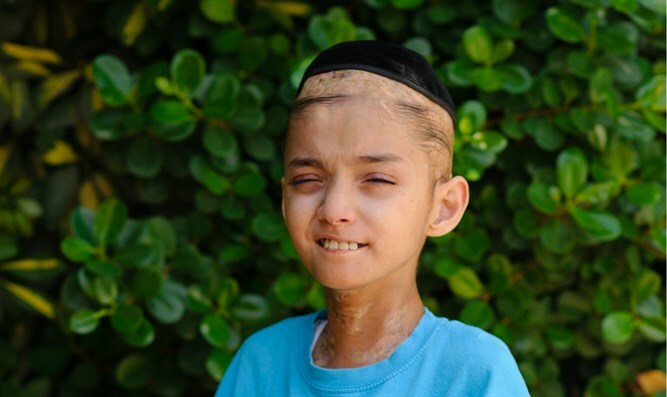 Uriel, who has been suffering from chronic childhood leukemia, is currently battling the physical and emotional scars of two bone marrow transplants, which put his cancer in remission but created a series of challenging side effects. On this particular day, Uriel was ready to engage in physical therapy. Personal outreach does have a distinct therapeutic effect, according to Professor Dina Ben-Yehuda, Director of Hematology at Hadassah Ein-Kerem, and Professor of Hematology at Hebrew University’s Faculty of Medicine. During the past year alone, ICSN has taken care of 10,000 people, providing transportation to and from the hospital cancer wards, medical and financial assistance, and 24/7 coffee stations. These services cost nearly $50,000 a month and over $600,000 a year. For more information about ICSN visit their website.